After a lifetime of tradition and mom’s holiday cookin,’ Christmas means family. So I was glad to have Kevin and Rachel around - a touch of home. And if I had to pick a place to make merry without my own flesh and blood, Salento turned out to be an excellent choice. It is a quaint town in middle of Colombia’s famous Cafetera, a favorite among foreigners and vacationing Colombians alike. So the streets were full, and the parks, shops, and restaurants came alive. 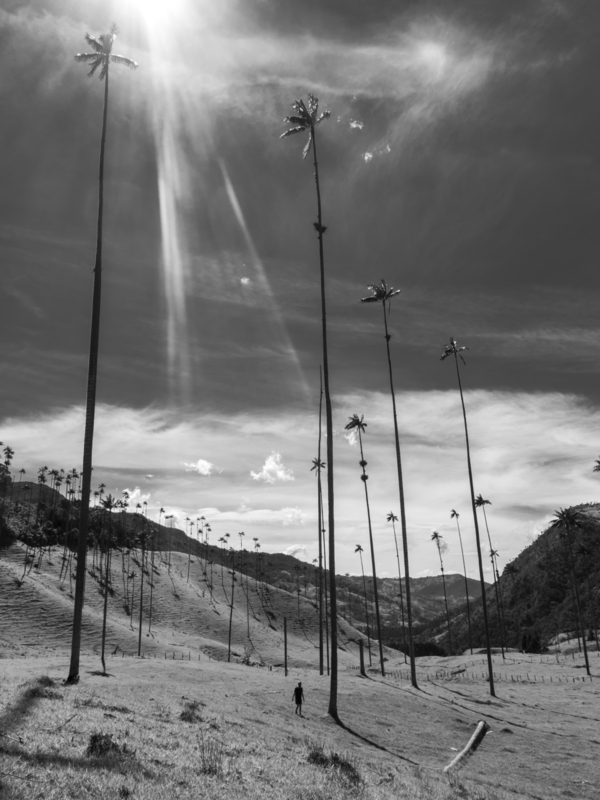 We spent most of the day hiking to the strange and stunning Valle de Cocora, a grassy valley studded with the world’s tallest palm trees. After a six hour trek, we had time for little more than a late lunch, a peanut butter brownie sunday, and a bit of window shopping, before ambling up the hill behind town for sunset. Even from that modest summit, we could see miles of lush, rolling hills, each covered with coffee plants and banana trees. As the last threads of daylight unravelled into a starry Christmas night, we walked back down the stairs and along the busy pedestrian drag towards the central plaza. A band had set up along the sidewalk, and a large crowd was gathered to sing and dance. Kevin and Rachel stopped for a moment, then left for a shower and a change of clothes. I stayed behind, enjoying the music from the fringes - a happy spectator. But I didn’t blend in, a recurring problem which has made me an easy target for many a busker. On this occasion, the lead singer said something about extranjeros, flapped his bent arms like a chicken, and finally pointed at me. Someone nudged me, and suddenly I was in the center of the crowd. The band pleaded for a Colombiana with brave toes, and a pretty woman emerged from the fray, as if by magic. When the music kicked in, I had no choice but to start dancing in front of what felt like all the world, which stopped to watch and take video. I hacked roughly at the beat, but the assembly cheered every time I seemed to get it right. The largest roar came when I accepted the woman’s invitation for a second dance - and a third. In the end, I spent almost an hour in the thick of it, laughing at myself and smiling. It felt like a perfectly South American Christmas - an embarrassing highlight.